Whether it is your first or your third, most women will find themselves wondering/stressing/ imagining (perhaps even obsessing 😉 over the birthing process. Although each one of us will have a beautifully unique experience, the following are a few amazing tools that helped me in labour. Keep focused on why your body is creating these intense contractions. Remember it is your baby making his or her way out into the world. During my pregnancy, I collected a few of my son’s ultrasound pictures and laminated them. They were a gift in labour, keeping me grounded and focused and cheering on the baby who was moving through to take his first breath. Always remember laughter is a potent stress and pain reliever. When you are packing your bag or setting up your chosen place for birth, select something that is guaranteed to bring a smile to your face. In the initial stages of labour, I pulled out my laptop and turned on a silly movie that has always caused that delicious deep belly laughter in me. This simple tool will help to ease your anxiety and relieve the intensity of the physical experience. Bring an exercise ball, your own meditation pillows or that special blanket that embraces you in a cocoon of security. Although I’m sure it was a surprise to the hospital staff when I lugged in my big purple ball, it was worth it!. This ball had become a part of my personal meditation practice in the last stages of pregnancy. It allowed me to sit comfortably and reduce discomfort. 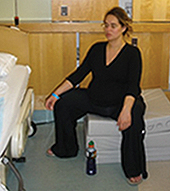 By utilizing this familiar tool in labour, I was able to more easily slip into my place of calm, connect with the little one within and soothe the tensing muscles. Remember, labour is natural. You are built for it, strong enough to move through it and in the end when you see those little eyes looking up at you…worth it. If you are struggling with fears around the birth process please use “Empowering the Body for Birth” (track 4). I would love to hear what tools and creative ideas you have used (or are planning to incorporate) into your labour! Sending you love and support during you personal journey to birth! Pregnant Foodies, This Ones For You!